Photo courtesy of F. Clark. Our bread is allergic to skin. that would be funny to see you carry bread between your toes. We don’t know where your hands have been! But we assume your mouth is just fine for some reason. If tongue not able, please use one of the lizards provided. 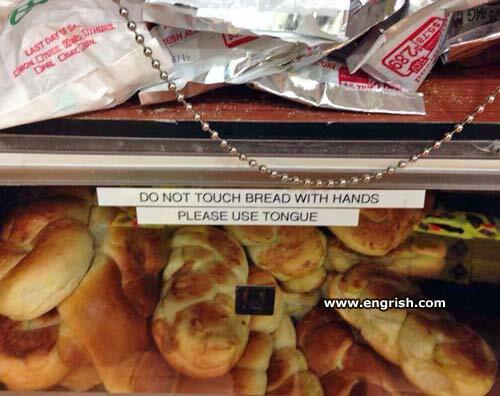 It must be French bread. But! You never know where it’s been. There will be weeping and wailing, and gnashing of teeth. YES! This bakery is HELL! Use tongue , then pumpernickel. I keep a pair of tongues by the fireplace. Is that a baguette in your pocket or are you just happy to see me? Nice bakery ya got here. It’d be a pita if something was to happen to it. I always touch things with my tongue! They only pay lip service to hygiene regulations. I can lick any man in the joint. Can you lick any Puppeteer in the joint? The tongues have been replaced by the Yakuza. @White Rabbit. But, can you lick pilots between the hangers? Of course. WHAT else, eh? Hey! Miley Cyrus would feel right at home in this store! May contain nuts are allergen. Possible body harm will exploit the vomit from your face and need doctor medicine by general hospital. Gluten free. That moment when you realize that the Japanese are actually frogs.